By the end of 2013, the e-commerce industry is projected to reach a staggering $254.7 billion in the United States alone. Worldwide, the industry is expected to reach $1.25 trillion by the end of the year. The amount of Internet users has reached over 3.5 billion people. Eighty percent of all Internet users in America (150 million) are frequent online shoppers. These incredible numbers are clearly representative of what a large industry e-commerce is becoming. Why exactly is Kansas City such a perfect hub for these big time e-commerce retailers? There are a variety of reasons. To understand these reasons, it is imperative to understand how the logistics of the e-commerce industry works. 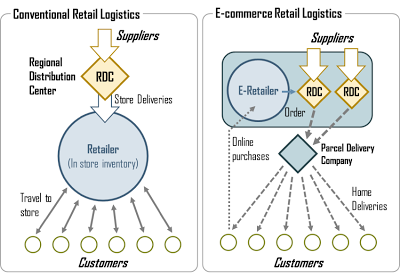 Traditionally, the retail-supply chain follows a path similar to the photo on the left below. In contrast, e-commerce sites use a bit more of a complicated system pictured on the right. The use of distribution centers and parcel delivery companies are essential. Here in Kansas City, we have all the pieces to make the e-commerce puzzle as efficient as possible. We are home to a multitude of distribution centers as previously mentioned. Secondly, we are home to a variety of third party logistics hubs, including 13 of the most prominent companies in the country. In the metro area, there are four different FedEx distribution centers, three UPS centers, and countless locations of the USPS. 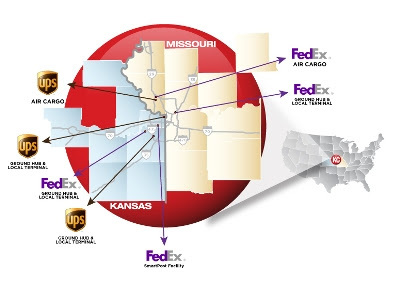 Thirdly, the Kansas City area’s centralized location makes it one of the most efficient shipping starting points in the nation. The vast majority of the continental United States can be reached from Kansas City in just 1-2 business days. This centralized location coupled with the city’s incredible access to four major interstate highways, five of the Class 1 railroads, and an international airport makes transporting products across the nation an incredibly quick and efficient process. KC SmartPort is working hard to make sure the Kansas City area receives due recognition for its prime e-commerce assets. We’ve successfully recruited an e-commerce giant, Zumiez, to relocate their primary distribution center from the state of Washington to Edwardsville, Kan. 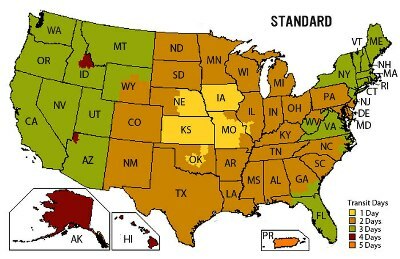 According to Zumiez, best practice for standard delivery is two to three days to most of the cities in United States. Zumiez selected the Kansas City region because this location allows them to focus on the company’s growing online business and increase the speed of product deliveries to online customers. As the e-commerce industry continues to grow, hopefully our city will continue to capitalize on its assets and continue to establish itself as one of the best cities in the nation for e-commerce companies to position themselves. Leung, Cara. "KC Is E-commerce Heaven." Think KC. KCADC, n.d. Web. 02 July 2013. "Retail Logistics and E-commerce." 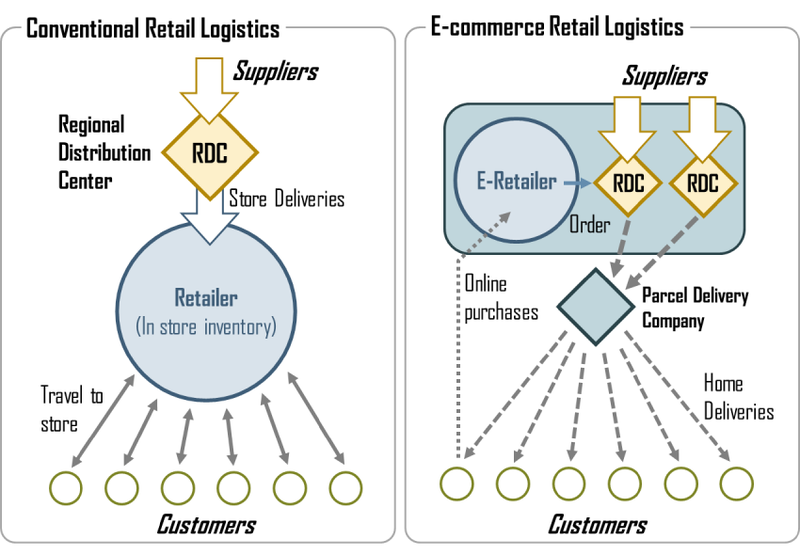 Retail Logistics and E-commerce. N.p., n.d. Web. 02 July 2013. "Third-party Logistics." Wikipedia. Wikimedia Foundation, 27 June 2013. Web. 02 July 2013. "Top 100 Grossing E-Commerce Sites Tweet Baymard.plugins.twitter.init();." Top 100 Grossing E-Commerce Sites Ranked by Checkout Usability. N.p., n.d. Web. 02 July 2013.